Sticky: Poll: Teen Titans Wave 2 - Polls are open! 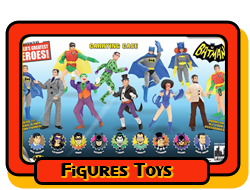 Toycade Exclusive Vote For Batman in stock! Getting So Frustrated With FTC! Unbelievable product they sell. Didn't last a whole day. Anyone else "classic Mego-izing" the FTC DC figures? Were any of the Supergirl figures made with correct sleeves? Should I get a refund? Knee pins - help!!!! how long after a figure is released before it is parted out at CTVT? do you think ftc will lower their price?